A homegrown student scholarship management application has spread its wings beyond the institution that originally developed it. ScholarshipUniverse, launched at the University of Arizona as "Scholarship Universe," has been rewritten from scratch and updated by CampusLogic for use in other schools. 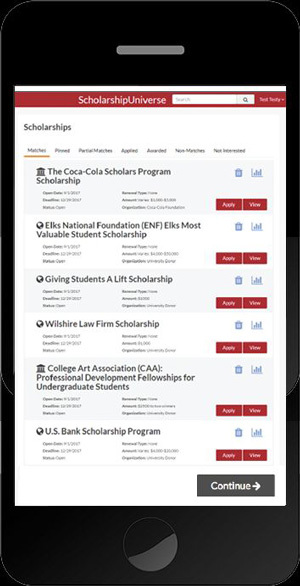 The product helps match students with potential scholarship opportunities and manage their applications; the new version is mobile-friendly and offers text notifications. CampusLogic produces applications for student financial services, including a program to deliver award letters digitally. One of its first customers will be the University of Arizona, which will be adopting the new edition of ScholarshipUniverse as soon as the current scholarship season has slowed for the Tucson-based university, sometime later this summer. According to Ken Downs, UA program manager in charge of the Scholarship Universe project, the new integration will provide better information to people seeking scholarships, grow the repository of scholarships and ensure more timely updates to the program. If a school is using CampusLogic's digital award letter product, for example, he said, "students will receive a digital award letter that does a much better job of explaining all the ins and outs of financial aid. And since it's all digital, you can plug in a lot of information like videos and links to other resources." For schools that subscribe to the service, the letter will also be able to include a link to ScholarshipUniverse, enabling students to jump in immediately, fill out a profile and begin to apply for relevant scholarships for their chosen institution. Also, CampusLogic will be taking over the database of scholarships that has been maintained by UA, which, noted Downs, "is going to continue to grow over time." The new edition accommodates multiple device formats and offers text messaging, "which we don't have," he explained. Whereas previously UA hosted the application on its own servers, CampusLogic runs the software on the cloud, with the benefits of guaranteed uptime, tightened security and greater redundancy. "And they obviously have a much larger team than we did," Downs said. "So they're going to be able to do more with it as they bring on more schools and partners. It's just going to continue to evolve and get better." The university initially developed Scholarship Universe to help its own students find relevant scholarships and navigate the process, said Rebekah Salcedo, UA's director of scholarships and financial aid, in a press release. "With Scholarship Universe we simplified the scholarship process, streamlining access to over $6 million of external funding to UA students in one year." The university was recognized with a Campus Technology Innovators award for the project in 2012. Currently, Salcedo said, over 70 percent of students at her institution have used the solution.